Penmaen Mawr is the largest mountain plateau in Wales and is located between Conwy and Bangor. There has been a quarry at Penmaenmawr since Neolithic times and axe-heads and other implements made from its distinctive stone have been found throughout the British Isles. 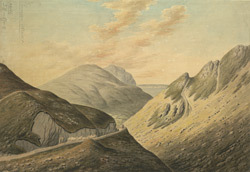 A new quarry was opened here in 1830 to meet the demand for granite needed to build roads. Rectangular slabs of granite known as ‘sets’ were mined, carved and transported via ship to England.